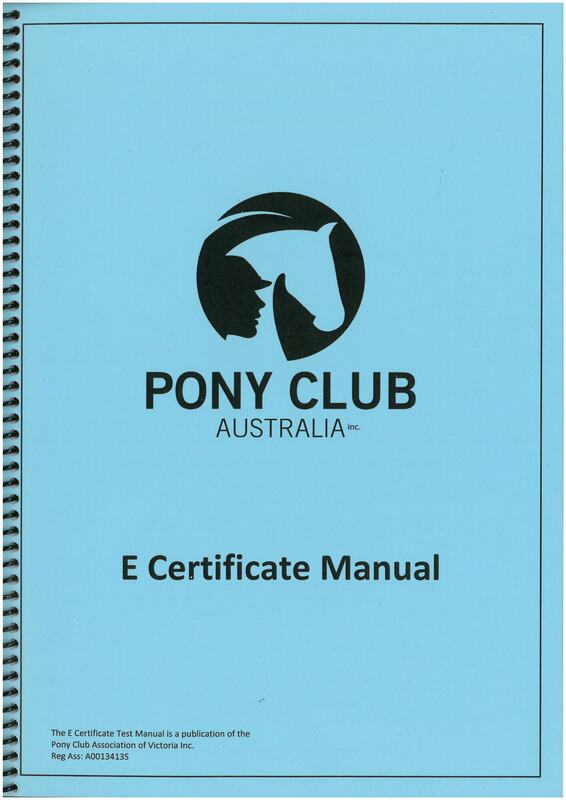 The Pony Club Australia Efficiency Certificate structure encourages Riding Members to prepare for and take tests which enables them to learn progressively about horse and pony care and riding (horsemanship). The assessments are designed for the member to progress from one standard of learning to the next with certain objectives in mind. Although some requirements of each assessment may vary slightly from country to country because of geographic location, local activities or climatic conditions, the assessments are based on a worldwide policy. Purchase the Syllabus of Instruction from the Pony Club WA Shop. 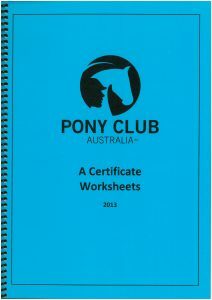 The Pony Club Australia (PCA) Syllabus of Instruction sets out in detail the requirements of each Efficiency Test and is available Online or from Pony Club WA Office or PCA National office. Efficiency ​Certificate Levels: E, D, D*, C, C* or K, B, and A, must be gained in that order. i.e. each is a pre-requisite for the higher standard, except E & D* which are optional Certificates. There is no pre-requisite for the H Certificate. Use the tabs below to explore the certificate levels and their basic guidelines. E, D and D* Examiners may be a member of the club for which they are examining. C, C*, K Examiners must be on the Accredited Examiners List. 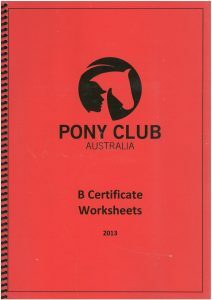 Examiners are required to complete both the Examination Marking Sheet (Found under each Certificate Standard tab) for each candidate as well as the Examiners Report Form for submission to Pony Club WA. Candidates must have reasonable control of their ponies at walk and trot. Some help may be given, such as allowing the ponies to work in company. Minimal help can be given with other tasks. To be keen to learn and improve. 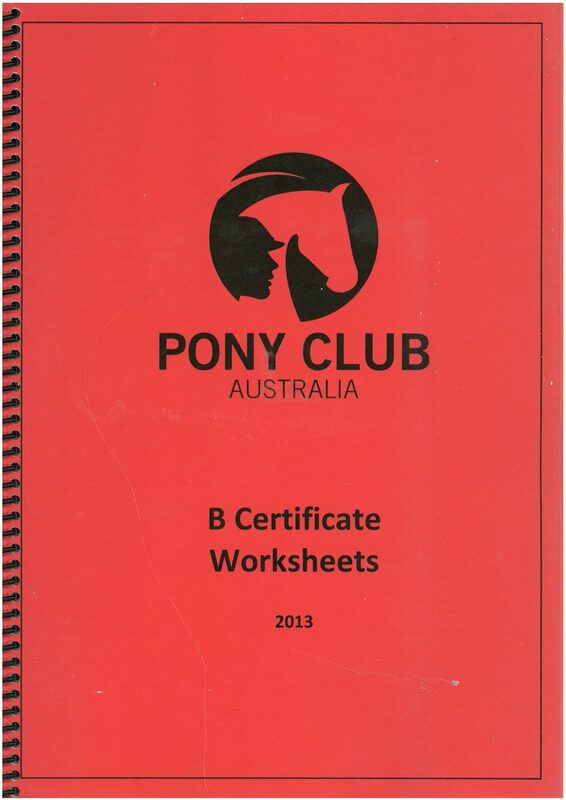 Purchase the D/D* Certificate Manual from the Pony Club WA Shop. Candidates must have reasonable control of their ponies. Some help may be given, such as allowing ponies to work in company. Many games are suitable for teaching if taken at an appropriate pace. To gain confidence in riding, handling and caring for a pony. Candidates must have a control of their ponies and show a more secure and correct position for flatwork and jumping. This certificate is an extra activity for any clubs wishing to include it in their curriculum, and fill in the years between 9 and 12. the D* Certificate is not a prerequisite for any subsequent Certificates. To improve the riders control of the pony. To have an elementary knowledge of the handling and care of the pony. Candidates should be encouraged to ride in snaffle bits where ever possible. If another bit is used, the candidate should know the name and understand its action. The rider should be able to maintain consistent contact through the reins. In checking diagonals or leading leg, the candidate may drop the eyes to look at the shoulders but may not drop the head or lean forward. Ideally the concept of ‘feel; through the seat should be introduced here. The forward jumping position/w with the steady lower leg should be established by the time of the test.Candidates may have to hold onto the mane or a correctly fitting neck strap over the jump. Demonstrate knowledge of horse handling and horse care as outlines in the syllabus. This is an alternative to the K certificate which bridges the gab between the C and B Certificates. Its purpose is to provide an incentive for members who, having achieved their C Certificate, would value an interim test to check progress and maintain interest. Encouraged to ride in a snaffle bit where ever possible. If another bit is used, the candidate must know the name of the bit and understand its action. Able to demonstrate active riding at a fast pace. Developing a correct and more effective seat, independent of the hands and reins when views from the front back and sides. Riding the pony to into a light, steady and even contact working towards accepting the bridle. Developing feels through the seat and should not have to look when checking diagonals or leading leg. Well established in the forward jumping position with a steady leg position and correct rein contact. To become an active rider with the knowledge of the aids and how to apply them correctly and effectively. To ride simple cross country and showjumping fences. This is an alternative to the C* Certificate, between C and B. It is designed for the active rider, and covers many equestrian aspects not included in other certificates. The K comprises of a compulsory section and a wide variety of optional subjects. To widen the candidates experience in various aspects of horsemastership. To become an active and efficient rider who is thoughtful for the horse. To improve skills in horsemastership and other horse related activities. This certificate may be taken in two sections. the first section, Horsecare, can be done from the age of 15, prior to the practical riding, lungeing and jumping section. Instructors and candidates must understand that there is a marked change of approach to instructing B Standard and what they endeavor to achieve by schooling the horse. The assessor should not expect perfection at this standard, however a candidate should understand what is being attempted. The candidate should have sufficient ‘feel’ to realise what is and is not being achieved, and have an idea of how to set about improving the work. The candidate must appreciate that the improvement of the horses balance and performance is entirely dependent on the improvement of the riders seat and the coordination of the aids. Automatically, with the strengthening of the riders seat, will come an increase in the riders ability to ride the horse up to stead contact to the bit. Through this the rider will come to influence the quality of the horses movements. The ability to do this, even to a degree, is a basic requirement for this standard. The candidate should be able to work and care for a fully stabled horse, and maintain its standard of training and health ie. for approximately one month period. If the candidate was asked to look after a horse belonging to someone else, they would be expected to maintain the horses standard of stable management, lunge the horse and ride the horses on the flat to maintain its level of fitness. To gain practical experience and knowledge of the care and conditioning of horses and be able to look after a stabled horse. To become a competent, all-round rider, who knows the reasons for what he/she is doing and is able to assess results. The candidate should be reasonably proficient at the sitting trot. The candidate must appreciate what effect the sitting trot has on the movement of the horse. It is permissible to hold the pommel to correct the position in the trot. The riders position at sitting trot must not adversely affect the horses balance, rhythm, tempo and acceptance of contact. To rider over different types of fences at specified paces. To be capable of riding and jumping their own horse, and assessing its performance. To be capable of joining in any suitable Pony Club activities of interest to the rider, for example, eventing, hunting, trekking, gymkhanas. etc. and looking after the horse before, during and after the event. To ride intelligently and with due regard for others on the roads. Apply the knowledge, both in the stables and on the horse. Knowledge alone is not enough. The assessor must be satisfied that the candidate has had practical experience in the given tasks. Have a genuine quest for knowledge and a desire to understand the reasons behind what they do. Have a well established, balanced riding position. Apply correct aids in a precise way. Develop the ability to put actions into words, thereby possessing the ability for self assessment. To become an educated horse person, able to ride with confidence and style on the flat and over fences. To understand the principles of training, including young horses, and to be able to put these principles into practice. To be capable of riding and jumping horses of all temperaments and stages of training and assessing the horse’s potential and how it could be schooled to improve ride and performance. To gain wide knowledge of the care and conditioning of horses. 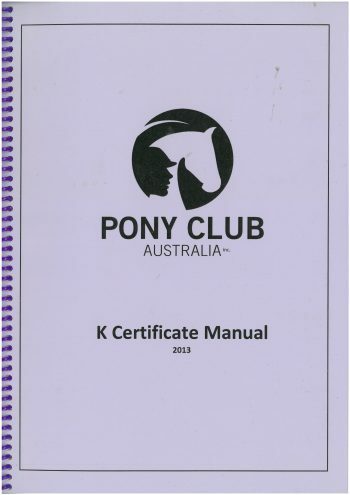 To have a sound knowledge of the organisation and running of pony club Australia and the candidates own state association. To have knowledge of other societies and organisations connected with horses. 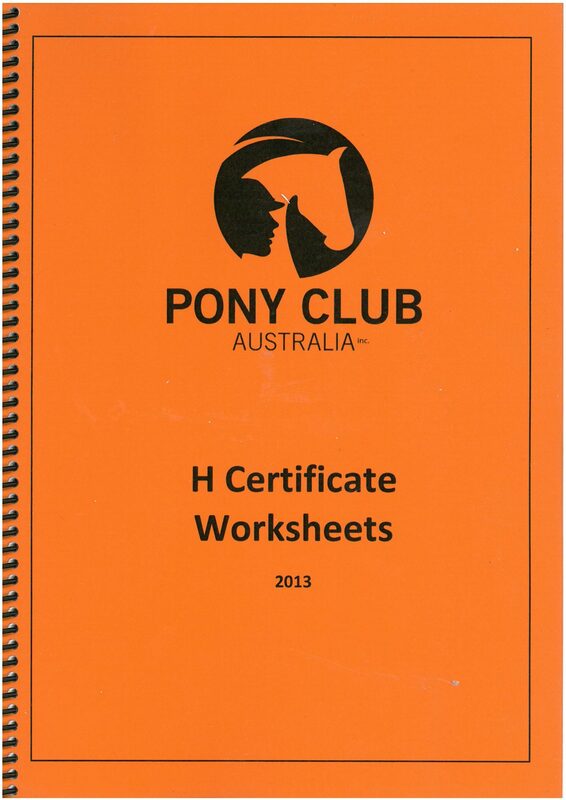 Purchase the H Manual through the Pony Club WA Shop. Prerequisites: Nil, Recognition of prior learning will be acknowledged for candidates who have completed previous certificates. Worksheets must be presented. 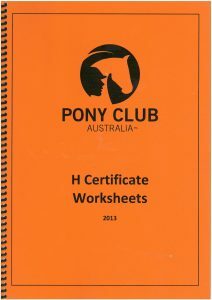 The H certificate is a horsemastership test. The syllabus centers on this aspect of work so that it is suited to the non-rider as well as the rider. Three years in Pony Club must be allowed for preparation. 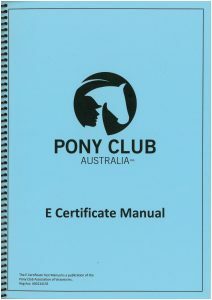 It is intended to afford keen associate members a worthwhile certificate for efficiency in horse management. To gain knowledge in the care and conditioning of horses and to be capable of taking charge of horses, either stabled or at grass.